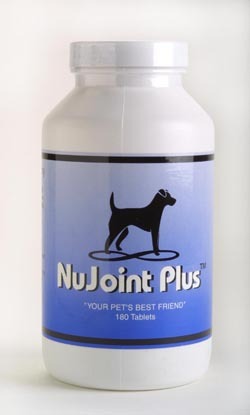 All of our dogs and puppies are on NuVet Plus Natural Vitamins & NuJoint Plus DS (Double Strength)Supplements. If you're looking for the absolute best vitamins... these are them. Your dog & Puppy needs both! These vitamins are by Breeders Referral only. 20,000 + Top Breeders in the USA Use, Recommend & Require their pups to be on these vitamins. A soluble fiber digestant. 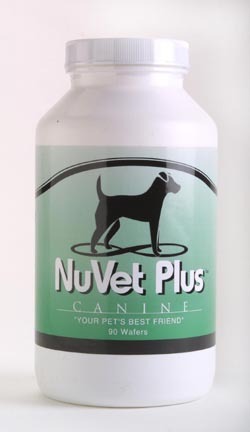 We believe NuVet Plus™ is the finest pet supplement available, however it must be able to be digested as efficiently as possible. Alpha Amylase creates the means by which the ingredients will be absorbed into the body as rapidly as possible without diminishing NuVet Plus™' powerful antioxidant capabilities. Pet foods high in protein may or may not contain all the necessary amino acids to maintain proper health of a pet. This deficiency could cause a host of problems ranging from indigestion, stunted growth, nervous disorders, or worse. NuVet Plus™, with its specifically blended natural ingredients, contains all the critical amino acids that must be introduced through the diet for proper health. Important for a healthy nervous system and regular heart rhythm. Helps prevent strokes, aids in proper muscle contraction, and works with sodium to control the body’s water balance. Potassium is important for chemical reactions within the cells, aids in maintaining stable blood pressure and proper transmission of eletro-chemical impulses. It also regulates the transfer of nutrients through cell membranes. Signs of potassium deficiency include abnormally dry skin, weakness, paralysis, low blood pressure, and irregular heartbeat which can lead to cardiac arrest and death. Contains collagen and glycosaminoglycans. This combination makes shark cartilage a powerful anti-inflammatory wound-healing agent that is non-toxic and has no known side-effects. It is also an effective substance against bacteria, virus and fungal infections, which stimulates the cellular and humoral components of our immune system. There have been numerous studies demonstrating the ability of shark cartilage to shrink some cancerous tumors, including those unaffected by standard treatments. In order to grow, a tumor must establish its own blood vessel network for nourishment. Like all other living things, if the tumor is denied nourishment, it will die. Studies performed at the Massachussetts Institute for Technology have shown that shark cartilage contains a protein that impedes the formation of blood vessels to tumors. Another role played by Taurine is maintaining the correct composition of bile and solubility of cholesterol. It helps stabilize cell membranes and seems to have some antioxidant and detoxifying activity. It also helps the movement of potassium, sodium, calcium and magnesium in and out of cells, which helps generate nerve impulses. Taurine is necessary for chemical reactions that produce normal vision. Deficiencies are associated with retinal degeneration and age-related cataracts.